MOMENTS THAT TRY MEN'S SOULS28th Division, throwing hand grenades, advancing against the town of Fismette, which was captured August 22, 1918. 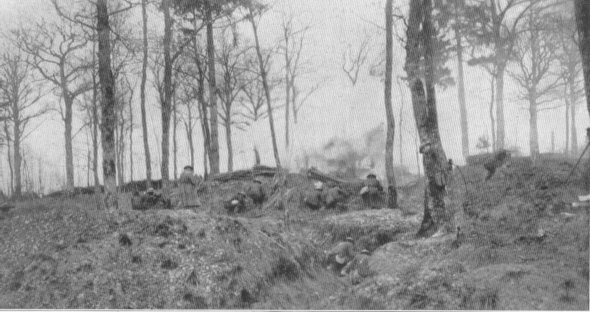 Heavy casualties were suffered by these National Guard troops from Pennsylvania as a result of a counter-attack. "In Fismette, the portion of the village of Fismes on the north side of the Vesle, I had a single company of infantry, 150 men of the 28th (Pennsylvania) Division. One day I was ordered to make a raid with this company. It was made with great determination, but the bluffs of the river to the east, north and north-west were lined with enemy machine guns, and the company, thus covered on three sides by the enemy’s fire, had no success. It was driven back into its cellars in Fismette. "This company could be reinforced and fed at night only across a broken bridge, now not even a foot-bridge. This crossing was swept from two directions by enemy machine-gun fire, and men crossed, whether by day or night, only at intervals, and then only a man at a time. In short, men could not cross. It was evident that whenever the enemy desired he could wipe out the company on the north bank of the Vesle. "After its failure in the raid, as ordered by our French general, I ordered that company withdrawn to the south bank of the Vesle River, man by man, at night. My chief-of-staff, who was very much in favor of the general’s idea of bridge-heads, knew of the order which I was going to give. When I returned from Fismes late in the afternoon, I found our French general at my corps headquarters, and that my chief-of-staff had informed him of my order to withdraw the company. The French army commander ordered me at once to replace it. It was done. "Three or four days after this affair, without my ability to reinforce it or save it, completely at the mercy of the enemy, this company was wiped out by an enemy attack. Then I noticed that the French communique of the day reported that my 3rd Corps had repulsed an enemy attack. When the French army commander appeared at my corps headquarters he offered me as consolation for his error this French communique. It was at least acknowledgment of the responsibility for the mistake. "But it did not console me for the only accident of my military career. I reported it at once to the American Commander-in-chief, General Pershing. "I did not answer. It was not necessary to answer. The general had spoken in the vehemence of his irritation." Author’s note: The raid referred to was not a raid but an attack. This little band of men was sent against the German army. As in the "Charge of the Light Brigade’ ‘—some one had blundered.